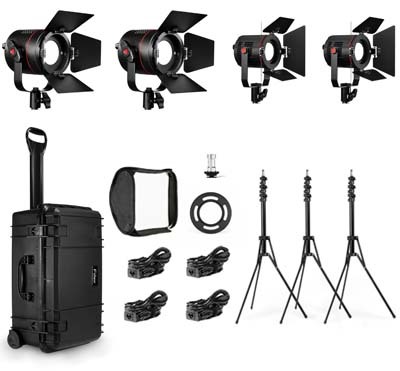 San Francisco, CA - June 7th , 2014 - Fiilex, a leader in LED lighting for the broadcast, film and photo industries, announces the release of their latest lighting kit, the K412. The kit is comprised of two P360EX lights and two P180E Lights, 4 Power Adapters, 3 Reverse Leg Light Stands, Softbox Kit, Cold Shoe Mount, and a Rolling Travel Case. Both lights are great for working in various environments and weather situations. They each have an IP-24 rating, allowing them to be used in rain and humid settings without a problem. The lights are Color Tunable between 3000-5600K and the P180E and P360EX have a tungsten equivalent output of 200W and 400W respectively. "We built these lights for image–makers who need more control in environments they can't control," says Brent Siebenaler Brand Manager for Fiilex. "The P180E has been such a great success in the ENG (Electronic News Gathering) world. So we gave the P360EX the great water and weather protection of our P180E, to create even more solutions for location lighting and field production." The P180E and the P360EX utilize Dense Matrix LED™, a patented technology, and the reason Fiilex lights are different from other lights. Dense Matrix LED™ uses patented heat dissipation technology to pack numerous LEDs on a single array. The result of this compact placement is super–bright point–like illumination source that features high CRI (Color Rendering Index) and adjustable color temperature. This technology is unique to Fiilex and the other brands of DiCon Lighting. The K412 Lighting Kit is available now from dealers throughout the US, Canada, and Europe. The US retail price is $3,349.00 For a complete list of dealers and accessories please go to www.fiilex.com.